Do you feel a machine could do your job? • Yes. • No. Because you're a decision- maker. Machines don't make decisions. The reason we know you're a decision-maker is because, otherwise, you wouldn't be getting this magazine to read. The publisher has qualified you to receive it because he has established that you are in a job and in a business which the editors have in mind when they put the magazine together. You're important to the advertisers, too. When they, too, have your job in mind, they're better able to design ads to meet your informational needs. And that's where BPA comes in. BPA audits the circulation records of publications to make sure they are correct and up to date—that you, for example, are qualified and are still on the job. 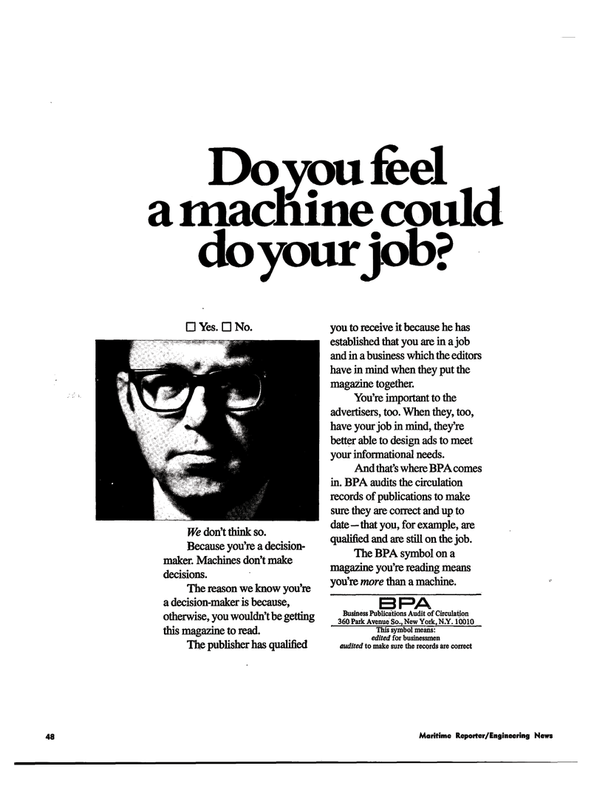 The BPA symbol on a magazine you're reading means you're more than a machine.